After working with Toyo Ito for eight years, Akihisa Hirata founded his own studio in 2005 and was already working on an important privately commissioned project in 2009, what became the Tree-ness House in Tokyo’s Toshimaku district. The idea originated after an exhibition about his work that architect Akihisa Hirata set up a few years earlier in one of Taka Ishii’s art galleries. 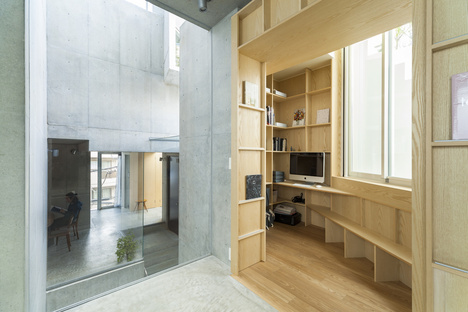 The Japanese patron of the arts then commissioned the young architect to design him a new house in the capital city, including an office and an exhibition space that attempts to go beyond the white box concept. Akihisa Hirata started working on the idea of combining personal and semi-public spaces, breaking down the parts and factoring in the additional element of nature, blending it with the city. The initial plan was for a building on eight floors, but the project was put on hold in the wake of the 2011 earthquake which destroyed the nuclear power plant in Fukushima and reduced to five floors when it was resumed. 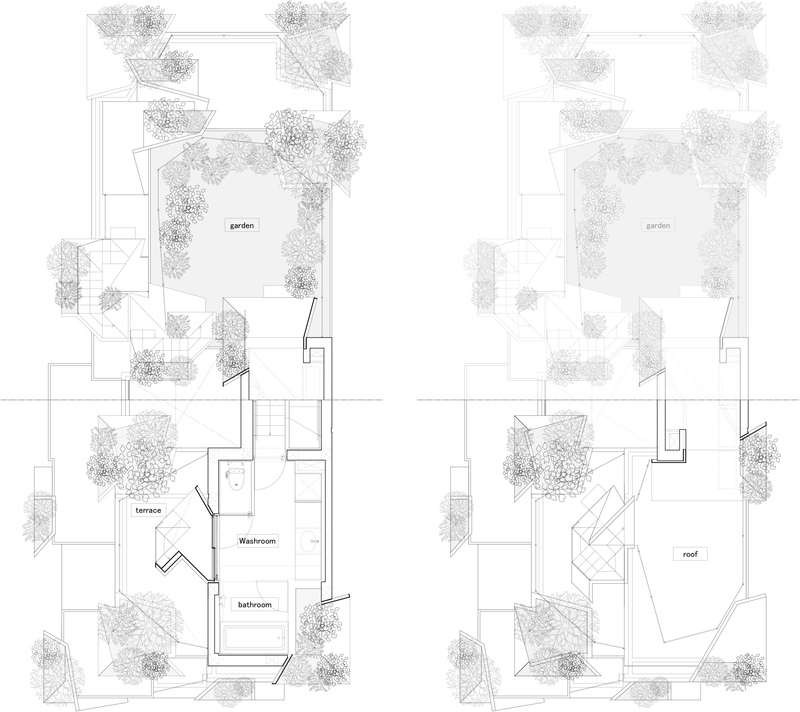 Built on a rather narrow rectangular lot squeezed between other houses, the home has completely closed-in semi-public spaces with vehicle access on the ground floor. 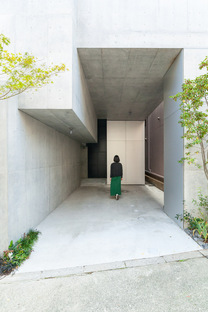 A second exhibition area is located on the first floor, sharing it with parts of Taka Ishii’s home, which is distributed over two floors on different levels culminating in a rooftop terrace. 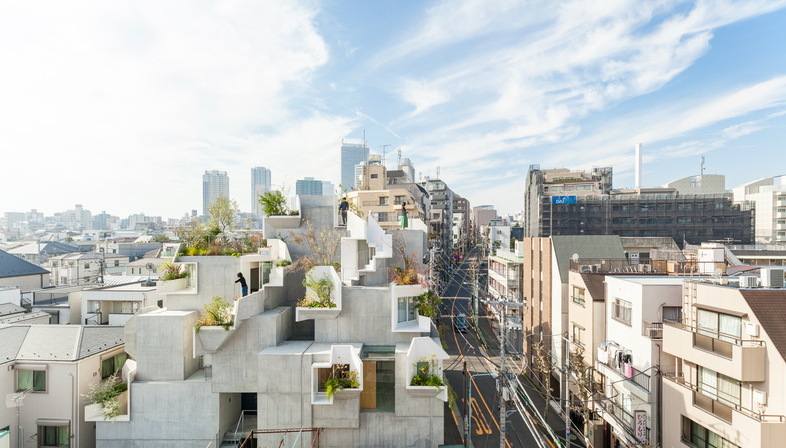 Akihisa Hirata wanted the Tree-ness House to have the organic appearance of a set of blocks, spaces of different sizes containing the living areas and bedrooms. At this initial stage in its composition, he designed what he calls “pleats” in the interior in which green plants could grow. There are three visual levels, characterised by perfectly smooth bare concrete, white-painted concrete in the pleats, and natural greenery. The architect drew his inspiration from a living organism, with potential for growth of the plants. This clear synthesis ensures that the building stands out on the urban panorama even though it is broken down into cells of different sizes arranged without a geometric grid. This order is not even disturbed by the presence of the clear parapets or slender metal railings, which disappear entirely from view. The building appears to have its origins in the light well in the centre of the layout, extending vertically from the parking lot to the rooftop terrace. 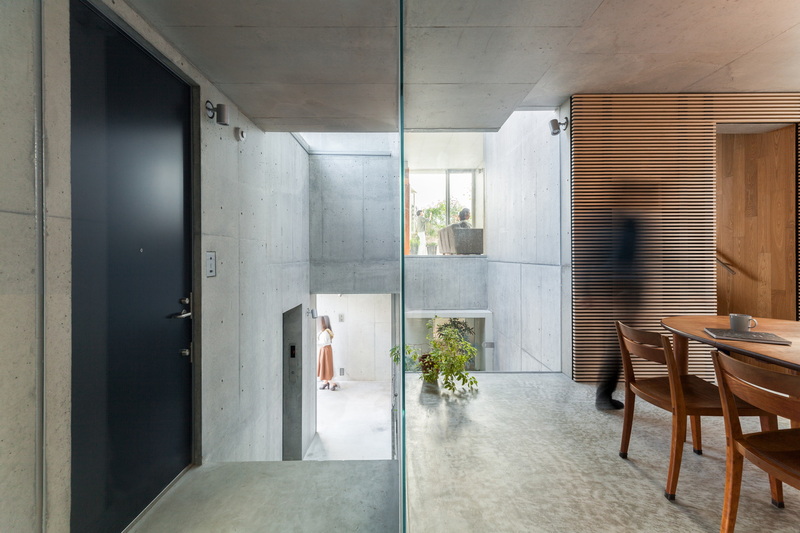 A number of rooms in the home have windows overlooking this space, through which they receive indirect light, while the elevator shaft, stairwell and utility areas are positioned adjacent to it to form part of the building’s technical core. Windows onto the terraces and the “pleats” are evenly distributed on all sides of the building and increase in number as the building rises and tapers off, as if imitating a mountain with more greenery at its peak. The Tree-ness House clearly contrasts with the usual reserved, introspective Japanese home, which is probably why it fascinates and marvels people on the neighbourhood streets. The “pleats” express a desire to merge inside with outside, and the stairs between the patios encourage an unexpected new dialogue with the city around the house. As the architect says, the outdoor and indoor spaces are reversed multiple times, encouraging the idea that the whole neighbourhood can enjoy this unexpected bit of nature. The interiors demonstrate a new way of combining small spaces that are never completely closed-in: the different levels permit unusual perspectives, generating a great sense of continuity between spaces. From the outside, this choice creates dynamic perspectives in which the rhythm is established by the alternation of windows and green terraces.